I remember when I was young, Rosanjin invited me and my father to go on vacation with him. He taught me that, when it comes to sushi, maximising the pure taste of ingredients is the most essential aspect. At this event, two kinds of fish – gizzard shad and soy sauce-soaked tuna, which are symbolic of Edomae sushi – can be tasted. Please enjoy Kyubey’s authentic sushi, which offers the finest flavour of ingredients. Founded in 1935, this sushi restaurant in Ginza marks its 80th anniversary this year. Although it’s known as one of the classic high-end sushi restaurants, it has evolved over the years based on advice from Rosanjin, and is now highly acclaimed for its authentic Edomae sushi which highlights the best flavour of each ingredient. Kyubey is also known for inventing Gunkan-maki (Warship roll), a type of sushi topped with fish eggs. Kyubey’s sushi has long been loved by many prominent Japanese figures such as Shigeru Yoshida and Naoya Shiga, and especially Rosanjin, whose patronage to Kyubey was so loyal that he even gave the restaurants several of his original plates. 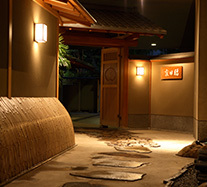 Founded as a ryokan in Toranomon, Fukudaya has taken pride in its cuisine ever since opening in 1936. It moved to its current location in Kioicho in 1945. 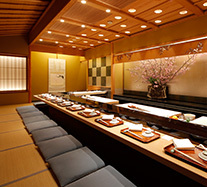 The restaurant's friendly relationship with Kitaoji Rosanjin started when Fukudaya's first proprietress sent out a letter informing him of the new opening.In the early Heisei era, the place was remodelled into a Japanese-style restaurant and, to this day, continues to be appreciated as an excellent representative of its style.Over the years, its regular customers have included important figures from political and business circles, but also prominent men of culture such as Hideki Yukawa, Yasunari Kawabata and Isamu Noguchi.Pottery by Rosanjin is displayed inside the charming restaurant, which retains the elegant atmosphere of its old ryokan days. This French restaurant is owned and run by chef Keisuke Matsushima, who at the age of 28 in Nice, France became the youngest foreigner ever to be awarded a Michelin star (retained for 10 consecutive years). In 2011, he became the first Japanese chef and the youngest person ever to be awarded the L'Ordre des Arts et des Lettres by the French government. Since 2009, in Tokyo's trendsetting district of Harajuku, Matsushima has offered southern French cuisine with the concept of 'experiencing in real-time the rustic luxury of Nice'. His menu reproduces the essence of French cuisine by expressing its history, geography and climate through the ingredients and dishes. Admission Entrance ¥1,000, students ¥800, children of elementary school age and younger ¥600, infants free; food ticket (Kyubey, Fukudaya) ¥1,800 (max. 200 tickets/day); Keisuke Matsushima 'Food Laboratory' ¥1,300 (max. 600 tickets/day). Food tickets must be purchased together with exhibition tickets. ※ Food tickets are limited to one ticket per person. ※ The use of a food ticket requires the purchase of an exhibition ticket. ※ All prices include tax. ※ Images for illustration purposes only.